Do you take off your shoes or keep them on? If the Thanksgiving meal is at your home then I’m thinking you know which you’ll choose. But, if you are heading to someone else’s home do you wait for a sign from the hosts; are they wearing shoes or not? You could always send someone ahead of you and follow their lead. I mean you could always just ask. 😉 Maybe you bring your own slippers next year and avoid the whole mess. I’m being a little silly about the whole thing and yet it really can be a dilemma, leaving your shoes on or taking them off. Often people dress up for the holiday meal and you likely don’t want to offend, be rude, seem out of place or anything. Doing a quick internet search turned up TONS of results filled with cultural reasons, science, and opinions on whither-tos and why-fors of taking off our shoes. Why did God ask Moses to take off his shoes? We equate taking off shoes with a sign of respect, as a way to honor someone by humbling yourself. Removing your shoes sets aside your pride in reverence for the someone of greater honor. As a protection from danger shoes keep the wear-er safe and able to flee. To take off your shoes leaves you vulnerable. Yet in that humbling, vulnerable state God invited Moses into His holy presence. In a way, standing barefoot, God and Moses were in communion in this holy moment and place. God brought Moses into His presence. The Old Testament is filled with regulations, ceremony required for the Israelite people to approach God. And here God brings Moses barefoot into this holy moment, place, experience of His presence. When do you need to be barefoot with God? This really is a big question: when do you need to take off your shoes with God? -What are you unwilling to surrender to the glory of God? -How do you hold back from experiencing all of God? -What do you keep between you and God so you can “run away” if times get tough? Salvation through the atoning work of Christ’s death and resurrection gives us peace with God. Jesus broke the barrier (Matthew 27:52) and the Holy Spirit indwells us (1 Corinthians 3:16). We are on holy ground. We too can be barefoot with God. Ephesians 6:10-18 sets out for us the Armor of God which allows us to stand firm in the battles of this world. Finally, be strong in the Lord and in his mighty power. Put on the full armor of God, so that you can take your stand against the devil’s schemes. For our struggle is not against flesh and blood, but against the rulers, against the authorities, against the powers of this dark world and against the spiritual forces of evil in the heavenly realms. Therefore put on the full armor of God, so that when the day of evil comes, you may be able to stand your ground, and after you have done everything, to stand. Stand firm then, with the belt of truth buckled around your waist, with the breastplate of righteousness in place, and with your feet fitted with the readiness that comes from the gospel of peace. In addition to all this, take up the shield of faith, with which you can extinguish all the flaming arrows of the evil one. Take the helmet of salvation and the sword of the Spirit,which is the word of God. In all the years that I’ve studied this scripture, the piece that left me perplexed was the “shoes:” your feet fitted with the readiness that comes from the gospel of peace. That was, until I realized that taking off our shoes could be the best way to “put on” the armor. Taking off our shoes to put God first. 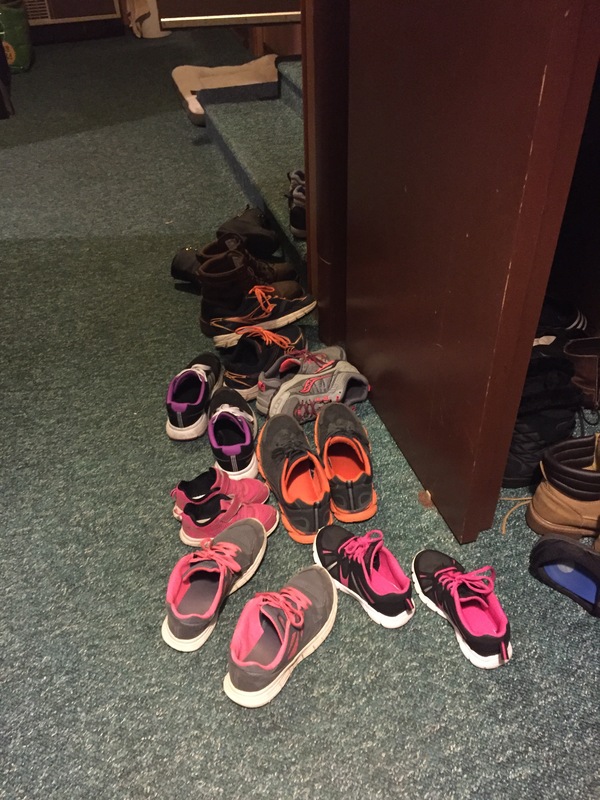 Taking off our shoes to be in communion with God. How is God calling you to be “barefoot” with Him? What keeps you from “taking off your shoes” with God?